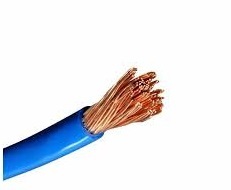 Geopower Single core/Industrial Copper Cables are highly flexible in construction and have high degree of thermal stability, Oxygen & temperature index. Manufactured with 99.97% Electrolytic grade, annealed bare copper and specially in house formulated PVC,these cables provide energy savings alongwith highest levels of safety. These wires/cables are used in control panels, machines and various electrical installations ,low voltage signals, electrical motors, electrical appliances, control panels, DC power transformers, electrical boards ETC. These wires are manufactured from bright-annealed 99.97% pure bare copper conductors and hence, offer low conductor resistance. The insulation is provided with a specially formulated PVC compound to withstand all kinds of mechanical abrasion while in use. PVC compounds used for insulation and sheathing have a high oxygen and temperature index & these properties help in restricting the spread of fire.